Finding the right headset is a balance of features, comfort, and sound. There are some clear winners, but often you’ll find yourself spending hundreds of dollars to check all of those boxes. In the affordable headset market, there are some caveats that need to happen. Great sound might come at the cost of build quality. A solidly built headset can often mean that audio suffers as a result. Because I treat my things nicely, I tend to prefer great audio quality first and foremost, but it also has to feel good to wear for long periods of time. There’s always the balance to maintain. Touted for its high-quality audio, I was more than eager to take the Roccat Khan Pro headset for a test run. The gaming headset market is overcrowded at the $100 price point, so they really need to perform if they want to stand out above the crowd. After running them through multiple games, from Destiny 2 to God of War, and then plugging them into my phone for some music, I came away less than impressed. On the high end, vocals and other details were extremely clear. Music, spoken word podcasts, and voice chat with teammates were all quite clear, and definitely the market that Roccat is aiming for with the Khan Pros aimed at esports and competitive play. The problems begin once you introduce bass and mixing of multiple sounds at once. Bass tones are relatively flat, which isn’t a problem in and of itself. I’ve actually loved a number of headsets that don’t have extremely heavy bass response. Too often an overload of bass is marketed as good audio when in fact audio definition is far more important than an overwhelming low end. The Roccat Khan Pro headset simply can’t handle multiple audio sources at once to make them sound engaging and immersive. Simple music like acoustic or vocal heavy tracks sound great, but introduce a lot of additional instruments and that high-end detail gets washed away in muddy bass response that can’t exist in the same place. The same problem is present in games, which present a number of different audio sources. The more audio this headset tries to handle, the more and more muddy and washed out every element seems. To ensure it wasn’t simply a defective headset or that I hadn’t blown out the speakers, I went back to listen to some very simple acoustic music with evocative vocal tracks. I was amazed at just how good this audio sounded and could hardly believe this was the same headset that had moments ago sounded like a muddy jumble of audio. I have an appreciation for headphones that let me determine the volume levels of my own audio. While I tend to try not to have headphones at full blast, I like knowing that I don’t need to be at maximum volume to get some decent sound through the headphone speakers. 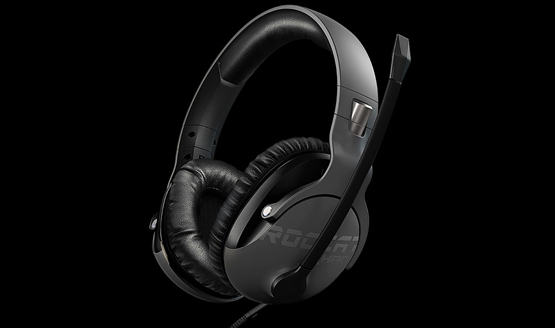 Cranking up the volume knob on the back of the left ear cup allows the Roccat Khan Pro headset to get plenty loud and I often had it at only about two thirds of the full volume level during general listening for music and games, which was still plenty loud. Using the mic, I never had any major problems and the audio quality was great. My teammates could always hear my consistently for game chat and call outs, though I wouldn’t recommend recording a podcast with it. The onboard noise cancelling kicks in quite early in some cases if you hold out certain sounds for too long, completely dropping out all mic input at that frequency. It’s a great feature for cancelling out external noises like fans, air conditioning units, and other general din, but can be overly aggressive on dropping out the speaker’s voice if it falls within that cancelling criteria. Other than this small and very specific issue, I was actually quite happy with the mic quality (and more importantly, the people forced to listen to me on the other end where happy with it). The leather ear cups are comfortable over the ears. They feature a taller oval shape which should help with people that are tired of the tops or bottoms of their ears getting caught in under the edge of the ear cup. While not completely sound eliminating, once audio is being played you won’t find a lot of external sounds bleeding in. One notable problem I have with the design is that the volume knob is exactly where I grab the headset to put it on and take it off. Too often I’ve put them back on to a fair amount of confusion about the difference in volume, either far softer or ear-burstingly loud. It’s easy to find with my thumb for on-the-fly volume control, but it’s too easy to turn the knob through simple handling of the headphones. 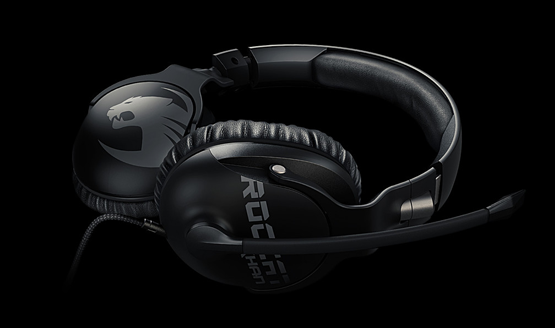 The Roccat Khan Pros come with features that are becoming standard, especially in headsets at this price point. Putting the microphone up will auto-mute the mic, and the flexible mic boom seems durable. At a glance visually, this headset doesn’t scream high end, but I was impressed with the solid build quality overall. Too often, solid build comes along with a lot of bulk (a big complaint I have about most gaming headsets), but the Roccat Khan Pro headset maintains a minimal footprint while feeling like a quality product overall. Long term use of any almost any headset tends to create discomfort that all too many headsets suffer from, but the Roccat Khan Pro reached levels of discomfort far ahead of most other models. There’s an odd narrow lump of plastic just beneath the headband cushion (likely where the wiring runs from ear to ear) that creates a very focused pressure point wherever the headband portion is sitting. The flimsy bit of cushioning covering it almost feels like an afterthought. I had no problem finding the problem by feeling the headband with my fingers, leaving me very surprised that the headband wasn’t designed in such a way as to disperse the surface area resting on top of my skull. The extra long braided cable is a welcome feature. Braided cables offer both flexibility and strength, and while the length may mean there some excess cabling to deal with, I’d rather have it and not need it than not have it and want it later. The connectors terminate in a split headphone/microphone input to use with PCs that take separated inputs, but there is an included adapter that brings it together to a single connector to use with phones and controllers that take the single input. The inherent split design outs the Khan Pros as a PC-centric headset, with other functionality coming via an extra connector. Having a Pixel 2 XL–which requires a headphone adapter for the USB C connector–this means that I now have two adapters between my headphones and phone. Anybody who knows half a thing about audio will tell you that the more adapters you have to use, the more opportunities there are for problems and audio degradation. As a console gamer, I’ll never use the split 3.5 mm inputs, so I’m forced to always keep track of the adapter if I want these to be useful for me. The Roccat Khan Pro isn’t a bad headset by any means. It’s simply competing in the wrong price bracket. For $100, there a number of other headsets that do more and perform better than this set of cans. It’s banking success on the “Hi-Res Audio” certification (having been the first gaming headset to obtain this), but that says nothing of the actual audio quality. Rather, “Hi-Res Audio” means that it hits a certain expanded frequency range. As a simple and straight to the point esports headset (which is how it is marketed), the Khan Pros might pique some interest. For the general consumer, the Roccat Khan Pro headset simply sits at too high a price point with too few features and a required cable adapter for most applications. Roccat Khan Pro headset review unit provided by the manufacturer. For more information on scoring, please read our Review Policy.